Eric looking back at Mount Columbia and the traverse route to Mount Harvard. It’s time to check out Nolan’s 14. Actually, it’s long overdue. 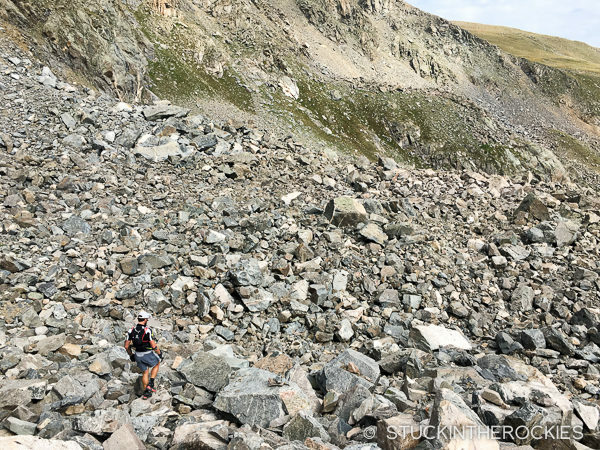 I first learned of the mountain challenge referred to as Nolan’s 14 back in 2001, as I was climbing the final 14ers on my list. 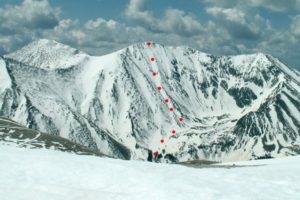 Conceived by Ken Nolan, the legendary peak bagger who has climbed every 14er, 13er, 12er, and 11er in the state, (that’s 1700 unique summits! 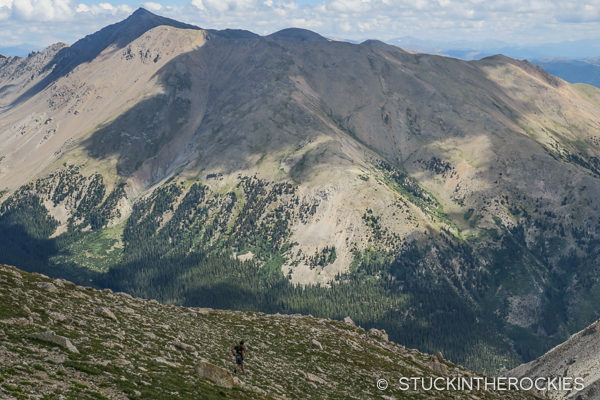 ), the idea is pretty simple: climb the fourteen Sawatch 14ers between Mount Massive and Mount Shavano in one push, and in under 60 hours. Massive, Elbert, La Plata, Huron, Missouri, Belford, Oxford, Harvard, Columbia, Yale, Princeton, Antero, Tabeguache, and Shavano. If it sounds like a lot, it is. It’s not a race or even an organized event. 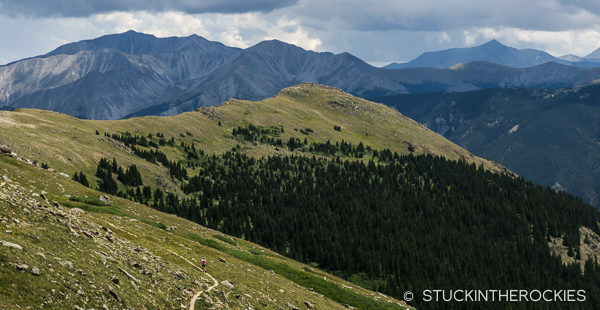 It’s just a course in the mountains that was designed to include as many 14er summits as can be linked up in about 100 miles. 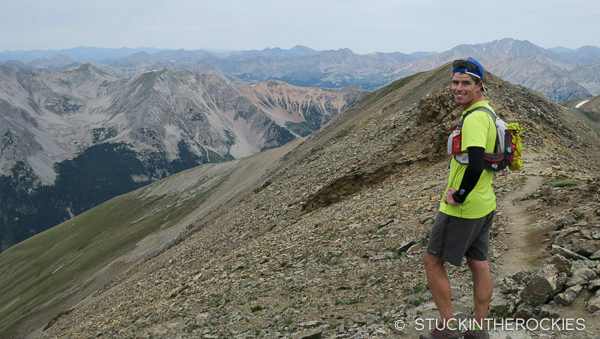 And since its conception in 1999, peak baggers and ultra runners have been trying to complete the Nolan’s course, with mixed results. You can tackle the peaks by any route you choose, you can start any day you like, you can even decide for yourself whether you want to follow the route from north to south or vice-versa. The starting point is fixed for each direction. You can begin at either the Fish Hatchery in Leadville, at the base of Mount Massive, or the Blank Gulch Trailhead by Shavano. The plan is to attempt the route heading north, starting with Shavano. This photo is looking south from the summit of Mount Yale, the fifth peak of the the northbound route. Mount Princeton (summit #4) is the large mountain out to the left, and the trio of Antero, Shavano, and Tabeguache (Summits 3, 1, and 2) are further out in the distance to the right. It’s a lot of ground to cover. Adding to its uniqueness is that there aren’t really any DNF’s. 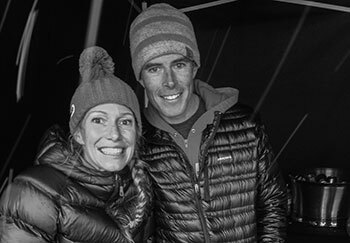 Your Nolan’s effort is recorded as the number of summits reached within 60 hours. The most you can do is 14, and if you reach that 14th summit before 60 hours has elapsed, take note of the time, that’s your finish. 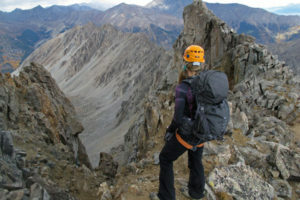 Anyone who hits 60 hours with less than 14 summits is simply credited with the number summits they reached. To date there are about 16 official sub-60 finishers. I can talk about the details of Nolan’s at length, but instead I’ll recommend people check out the Nolan’s website here. It’s kind of dated but it does offer some useful historical context. And there are some links to maps used by the original group that first completed the course. I feel like it’s a good time to finally give this thing a try. A friend of mine, Eric Sullivan, is serious about it too, and we’ve been out on the course doing quite a bit of recon. We’re planning on making an attempt at Nolan’s as a team sometime soon, when weather and the schedule line up. I thought I’d share some of our course scouting days here, loosely arranged here in the northbound direction we’ll be going. Sully made two attempts at Nolan’s on skis this past spring, something that hasn’t been completed before. Here he points out features of the ridge from the summit of Princeton. We’ll be approaching Princeton from the mountains in the background. Heading off the summit of Princeton, peak #4 of the route. 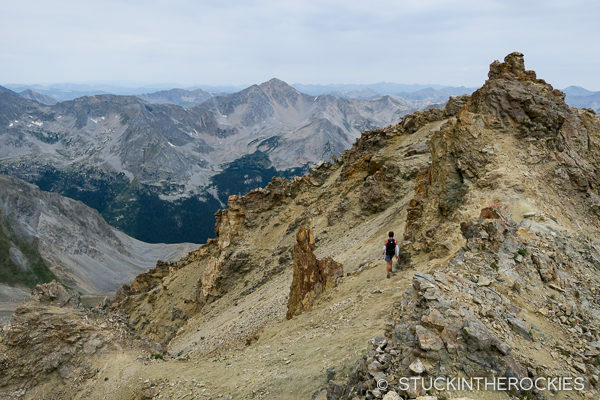 A look at the route of descent on Princeton, a long, trail-less stretch of talus and scree. Almost through another messy section and down to treeline in Maxwell Gulch on Princeton. Sully descends from the summit of Yale. The next peak on the route will be Columbia, out in the distance. 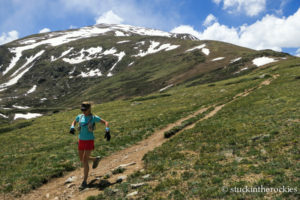 To keep things more interesting on our Yale traverse outing, Christy diverged from the Nolan’s route and descended the Denny Creek Trail and then ran up to Browns Pass and over to Kroenke Lake to meet us. 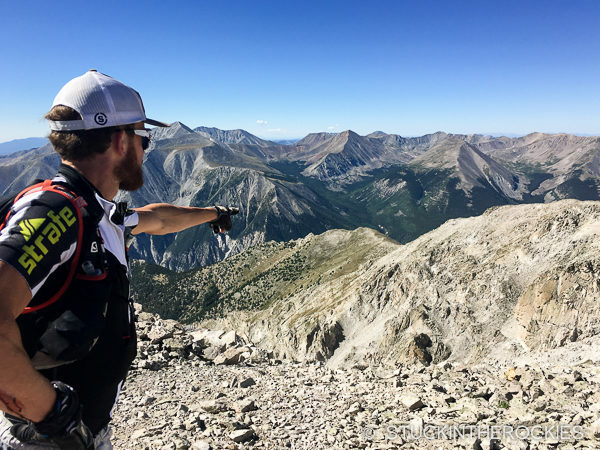 After we were done with our recon of Yale (pictured here) we headed up to Kroenke Lake to meet up with Christy by Browns Pass, a fun little side tour. Maybe not an ideal day to recon the traverse between Columbia and Harvard, but Christy and I still made the push to the 14,071 foot Mount Columbia summit anyway. Christy was happy to join on some of the recon, but isn’t planning on attempting Nolan’s with us. Maybe some other time? Assessing the route at camp. 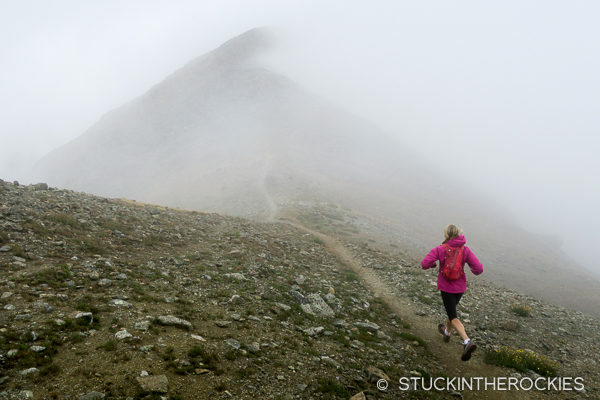 Just your standard cross-country route above treeline. This is the linkup between Columbia and Harvard, summits #6 & #7, on a nicer day. After the Columbia-Harvard traverse the recon for the day was complete, and we descended down to the trailhead just as the weather was moving in. The view from the summit of Missouri, summit #10. Belford and Oxford are out to the left, and Mount Harvard, summit #7 is far across the Pine Creek Valley to the right. Just off the summit of Missouri, Sully heads in the direction of the next summit, Mount Huron, out in the distance. On our way up Huron Peak from Cloyses Lake. Sometimes even the “best” route isn’t all that good. 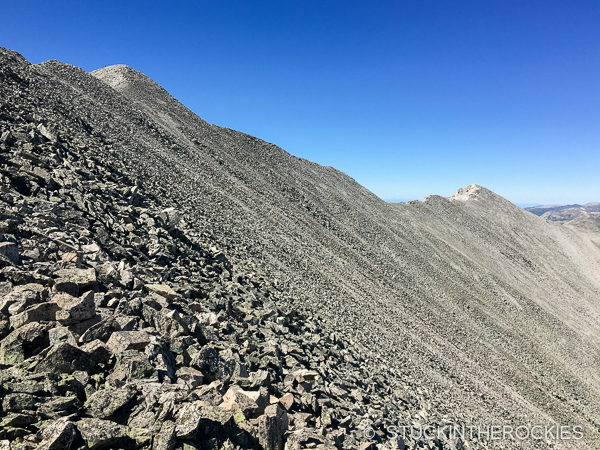 In this case we just have to battle the talus and scree up the hill to the low point on the ridge, which will get us to a better trail that leads to Huron’s summit. 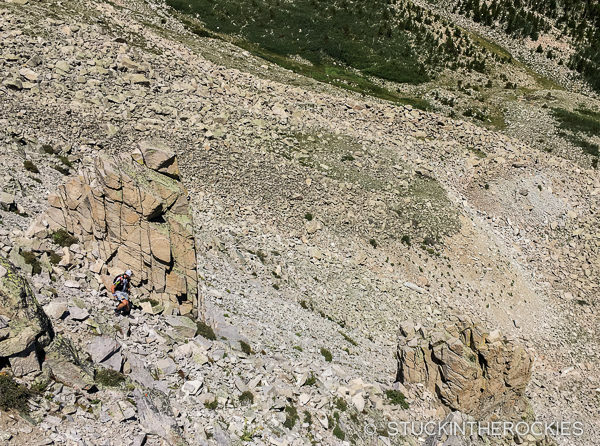 As the 11th peak of the route, you can bet this will be one of the “less-than-fun” stretches. 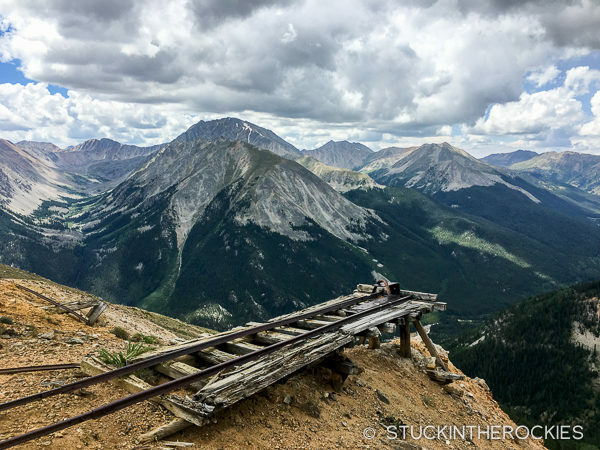 Some old mine relics on the Echo Canyon route we follow up Mount Elbert. 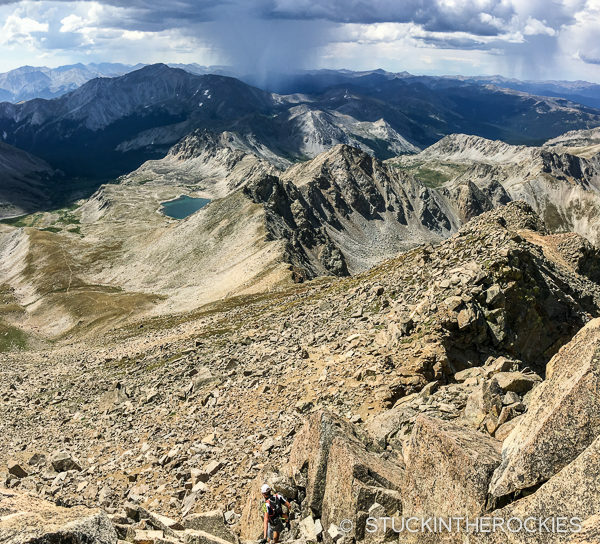 La Plata Peak, summit #11 is out in the distance. 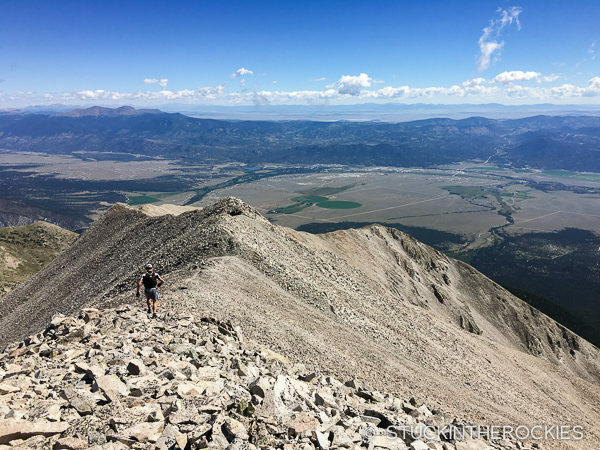 A visit to Mount Elbert, summit #13 of the route, and view of the descent down to Halfmoon Creek. Mount Massive is in the distance, the final summit of our south-to-north attempt, still quite far away. Our descent route goes down the ridge and then left, on a mostly trail-less slope, down to the valley below. I’ve learned through the years that the preparation for the big goals in the mountains can be more fun than the actual full effort. Reconning this route with Sully and Christy has been really cool, it’s brought us back to mountains and parts of the state we hadn’t been to in years. I know the final attempt won’t be as fun at times, so we’ve been sure to try to enjoy these recon days. On Missouri, feeling good about the course and our route decisions. Time to give it a go. 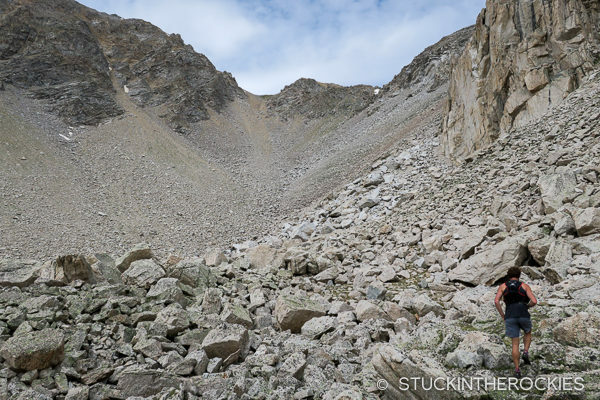 A trip report from a ski descent of the North Face of Tabeguache Peak. Pretty cool recon missions, Ted, and nice photos as always. Super excited for you in this attempt. Great to hear you and Sully will be a team in this arduous endeavor. Best of luck! Thx Brandon. Looking at weather now. And crew availability. It’s a lot to coordinate. Fun, but a lot. Sure thing, Ted. Hey, ignorant question here, but so will Christy and others resupply you two every so often along the journey? Like with bars, water, clothing, etc? Good question. Crew (Christy and others) will be at some of the places we cross the valleys between the peaks. Between Antero and Princeton, between Princeton and Yale on Cottonwood Pass Road, a big stop in Winfield, Highway 82 after La Plata, Halfmoon Creek. All told and including the start and finish there are eight crew access points along the route. There are additional access points other groups have used, such as Pine Creek or Cloyses Lake, but they’re tough to get to and so we’re not asking crew to be there. Understood, Ted, and great to hear. Thanks for the explanation. Thx for sharing that. We followed along back in 2014, it was an impressive achievement made even better by fundraising around it. 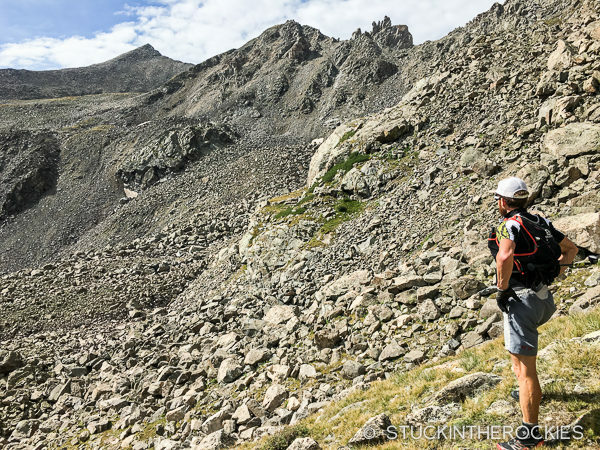 If skiing the route is ever attempted in any regular sense, the Roy’s definitely get the credit for setting the bar first. Eric was thinking the 60 hour cutoff was possible on skis so yes, he’s hoping to match the summer Nolan’s criteria if and when he attempts it again. Maybe next spring. Pulling it off in any amount of time is a huge feat. And while I haven’t attempted it in either timeframe, I personally think the Roy’s model sounds like more fun. Ken Nolan, as amazing as he is, didn’t conceive of this route. I assumed the same until I met him and asked him about it. The name refers to Jim Nolan: http://mattmahoney.net/nolans14/nolans14_story.html . Best of luck out there, Ted. Excited to see what you can do on this! Thanks for the clarification, John. Sounds like Fred Vance gets the credit for Ken Nolan’s outline. I’ll put a little edit in there. On a slightly related note, I feel like the whole thing could use some more clarification. I’ve been following the attempts of others for years now and there’s a lot of ambiguity in the “rules” and what’s accepted practice. There’s continual chatter about style and standards with little consensus. With it only increasing in popularity I feel like Matt Mahoney and some of the original guys should organize a few things. They may not want to, but they risk their achievement being diluted by loose standards if things aren’t clarified. 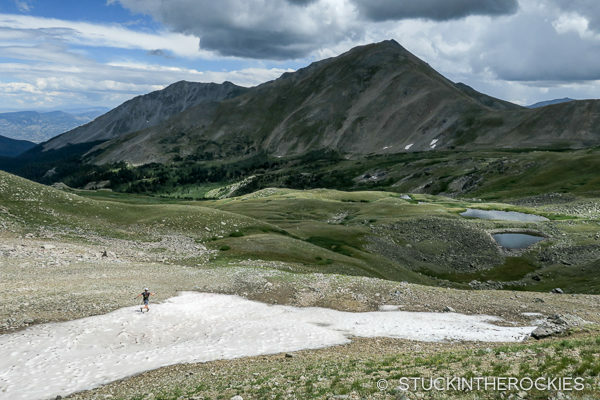 To make a comparison to skiing the 14ers, something I’m familiar with, Lou Dawson was first and laid out rather meticulously, the standards by which he subscribed. Since then (1991) all other finishers have aimed to meet his standard. It wouldn’t take very long to offer some updated “rules” on the website. I’m eager to make an attempt on this, and I want to do it the right way, or whatever is the actual standard. Crew, support, pacers vs. partners, it seems like a lot of people can’t even agree on where the finish is. I guess we’ll just do our best. The Night Stalker is totally worthy of Nolan’s 🙂 even though I’ve seen it chew up and spit out some solid folks. 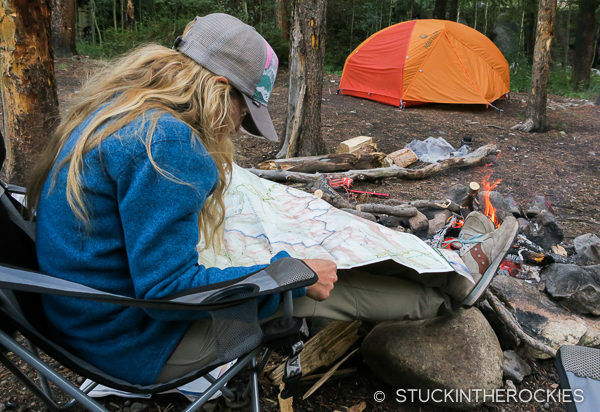 You’ve got more backcountry experience than many, you do your homework, and you’ve got the endurance cred. Thx. I’m not sure how it will unfold, I’m just looking forward to finally giving it a go.